SPG has launched a new online Tap Into Luxury-game for featuring number of different properties around the world. You can participate by spinning twice a day until September 30, 2014, and win one of the instant prizes and get an entry to winning the grand price. You can access the SPG game here. United States (including the District of Columbia), Canada (excluding Quebec), Australia, Austria, Brazil, Belgium, China, Egypt, France, Germany, Hong Kong, India, Indonesia, Ireland, Italy, Japan, Malaysia, Mexico, New Zealand, Philippines, Portugal, Russia, Saudi Arabia, Singapore, South Africa, South Korea, Switzerland, Taiwan, Thailand, Turkey, United Arab Emirates and United Kingdom. • Free Night Award: 195 Awards available for any SPG-participating Category 1â€“5 hotel or resort. Approximate Retail Value (ARV) is US$145.00. Award will be available in the SPG member’s account within three (3) weeks from the Game Period end date. • Starpoints® Award: 390 Awards available. 500 Starpoints: ARV US$12.50; 1,000 Starpoints: ARV US$25.00; 5,000 Starpoints: ARV US$125.00. Starpoints will be added to SPG member’s account within three (3) weeks from the Game Period end date. Use and expiration of Starpoints is pursuant to the terms and conditions of the SPG program. • iTunes® US$50.00 Gift Card: 156 Awards available. Gift Card will be fulfilled by mail within four (4) weeks from Game Period end date. Prize only available to U.S. residents with a mailing address in the U.S.
• $50.00 Ticketmaster Cash Code: 975 Awards available. Cash Code will be fulfilled via immediate confirmation email upon winning. Prize only available to U.S. residents. This game seems to have been done to celebrate SPG’s partnership with US Tennis Association, as there are some prizes that you can win at the US Open Tennis Championships, which is on-going. The iTunes gift cards and Ticketmaster Cash Codes are only available for SPG members with US account address. The free night awards are available for members worldwide. 1. ELIGIBILITY: The Starwood Preferred Guest® (SPG®) Tap Into Luxury Game, (the “Game”) is open only to legal residents of the United States (including the District of Columbia), Canada (excluding Quebec), Australia, Austria, Brazil, Belgium, China, Egypt, France, Germany, Hong Kong, India, Indonesia, Ireland, Italy, Japan, Malaysia, Mexico, New Zealand, Philippines, Portugal, Russia, Saudi Arabia, Singapore, South Africa, South Korea, Switzerland, Taiwan, Thailand, Turkey, United Arab Emirates and United Kingdom who are at least 18 years of age or older and have reached the age of majority in their respective jurisdictions at the time of entry. Employees of Starwood Hotels & Resorts Worldwide, Inc. (the “Sponsor”), United States Tennis Association Incorporated (“USTA”), their respective parent companies, subsidiaries, divisions, affiliates, suppliers, distributors and advertising, promotional and judging agencies and all their immediate family members (spouses, parents, children, and siblings and their spouses) and household members of each (whether related or not), are not eligible to participate or win. Void where prohibited by law. All federal, state, local, provincial and municipal laws and regulations apply. 4. GAME PERIOD: The Tap Into Luxury Game is scheduled for play starting August 23, 2014, at 8:00 a.m. Eastern Daylight Time and ending September 30, 2014, at 11:59:59 p.m. EDT (the “Game Period”). Sponsor is the official timekeeper for this Game. Entries submitted prior to or after the Game Period will be disqualified. a. Online Game: Starts August 23, 2014, at 9:00 a.m. EDT and ends September 30, 2014, at 11:59:59 p.m. EDT. b. On-Site Game: Starts August 23, 2014, then continues August 25 through September 8, 2014. Daily start and end times are determined by the Tournament schedule and/or the Sponsor’s on-location representation, and may be interrupted or discontinued at any time. a. To Participate: You must be a member of the Starwood Preferred Guest program at the time of entry and at all subsequent times throughout the Promotion Period. Nonmembers who would like to participate must enroll in the SPG program online or via the Game itself at spg.com/tapintoluxury and complete the SPG program enrollment form. b. To Enter: Visit spg.com/tapintoluxury and enter your SPG member number and email address. c. To Play: Follow the link and instructions to play (aka “spin”) the Tap Into Luxury Game. The Tap Into Luxury Game results will be instantly displayed. If Game Device indicates that the entrant is a winner, the entrant is the potential winner of the designated prize. Each SPG member is eligible to make two (2) spins per day during the Online Game Period. d. Grand Prize Entry: Each unique Tap Into Luxury play/spin automatically earns one (1) entries in the random drawing for the Grand Prize. a. Event Location: US Open Tennis Championships grounds outside the Arthur Ashe Stadium, Flushing, New York, USA (the “Event”). A US Open ticket is required for event admission. c. To Play Tap Into Luxury: Entrant interacts with the electronic tablet (the “Game Device”) to play Tap Into Luxury. If the Game Device indicates the entrant is a winner, the entrant is the potential winner of the designated prize. 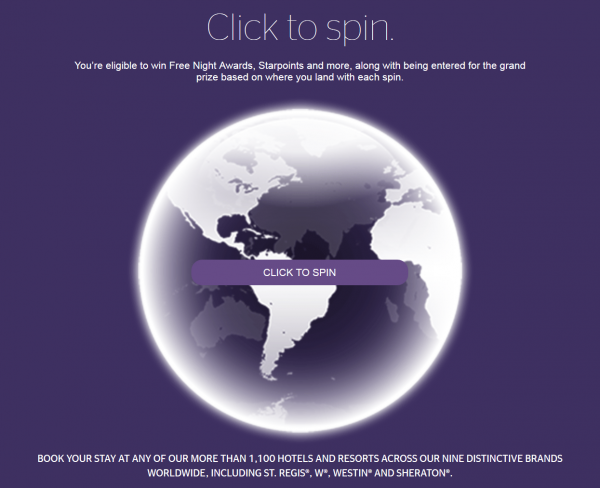 Each SPG member Is eligible to make one (1) spin per day during the On-Site Game Period. d. Instant Prize Claim. To claim an instant-win prize, the participant must be an SPG member. Membership in the Starwood Preferred Guest program is free. Visit spg.com/usopenjoin or call 888-625-4988 to join. e. Grand Prize Entry: To enter for the Grand Prize random drawing, entrant must submit all the information requested on the Sponsor’s on-location Electronic Entry Form. You must be a member of the Starwood Preferred Guest program at the time of Grand Prize entry and at all subsequent times throughout the Game Period. Membership in the Starwood Preferred Guest program is free. Visit spg.com/usopenjoin or call 888-625-4988 to join. Sponsor is not responsible for late, lost, incomplete or misdirected entries; interrupted or unavailable network servers; or other connection miscommunications, failed phone or computer or telephone transmissions, or technical failure, jumbled, scrambled or misdirected transmissions or other errors of any kind whether human, mechanical or electronic that may affect the Game-entry process. All entries become the exclusive property of the Sponsor, and none will be acknowledged or returned. Use of any automated system or agency relationship to submit entries is prohibited and will result in disqualification. The Game will be conducted on the Sponsor’s behalf by an independent judging organization (the “Administrator”) whose decisions as to the administration of the Game and the selection of the potential winners are final. a. Tap Into Luxury: The Game Period is randomly seeded with winning time tags. Each entry that occurs throughout the Game Period will be stamped with the exact date and time of day the entry took place (“Time Stamped”), and then recorded in the Sponsor’s Game Database. The Time Stamp of the entry will determine the first entry recorded after a scheduled winning tag. The registered entry that is Time Stamped first after a scheduled winning time tag will be identified as a potential winner of the prize indicated in accordance with these Official Rules. LIMIT: One (1) Tap Into Luxury Game Prize per person during the Game Period. ALL POTENTIAL WINNERS ARE, AT THE SPONSOR’S DISCRETION, SUBJECT TO VERIFICATION BY THE SPONSOR’S ADMINISTRATOR, WHOSE DECISIONS, IN ACCORDANCE WITH THE OFFICIAL RULES, ARE FINAL AND BINDING IN ALL MATTERS RELATED TO THE GAME. AN ENTRANT IS NOT A WINNER OF ANY PRIZE, EVEN IF THE GAME DEVICE SHOULD SO INDICATE, UNLESS AND UNTIL AFFIRMED BY THE SPONSOR’S ADMINISTRATOR. THE SPONSOR WILL NOT ACCEPT EVIDENCE, INCLUDING A SCREENSHOT, OF WINNING IN LIEU OF ITS VALIDATION PROCESS. ANY PLAY THAT OCCURS AFTER THE SYSTEM HAS FAILED FOR ANY REASON IS DEEMED A DEFECTIVE PLAY, IS VOID AND WILL NOT BE HONORED. b. Grand Prize Drawing: The potential winner will be selected in a random drawing conducted on or about October 8, 2014, from entries received during the Game Period. The drawing will be conducted on the Sponsor’s behalf in St. Paul, MN, by Interactive Games, an independent judging organization whose decisions as to the administration of the Game and the selection of the potential winner is final. Odds of winning depend on the number of eligible entries received. The Sponsor will attempt to notify the potential winner via mail, email or phone within five (5) days of the drawing. If the potential winner does not respond within two (2) days after the first attempt to contact him/her, the Sponsor will select an alternate potential winner in his/her place at random from all eligible entries received. The Grand Prize potential winner will be required to complete, sign, have notarized, and return an Affidavit of Eligibility, a Liability Release and, where lawful, a Publicity Release within three (3) days of notification. If the documents are not returned in a timely manner, or if the potential winner is found not to have complied with these Official Rules, or failed to provide accurate entry submission information, or is ineligible for any reason, the prize may be forfeited. The potential winner may be required to provide proof of identification and submit to a background check, as determined by the Sponsor, in its sole discretion, in order to receive prize. If a potential Grand Prize winner is a resident of Canada, he or she must successfully answer a mathematical skill-testing question. Failure to successfully answer the question as stated will cause the prize to be forfeited. In the event the Sponsor, in its sole discretion, determines that any entry does not otherwise comply with the Official Rules or any other applicable regulatory guidelines, Sponsor reserves the right to disqualify such potential winner. • Free Night Award: 80 Awards available for any SPG-participating Category 1â€“5 hotel or resort. ARV US$145.00. Award will be available in the SPG member’s account within three (3) weeks from the On-Site Game Period end date. Grand Prize: One (1) Grand Prize winner will be awarded 250,000 Starpoints: ARV US$6,250.00. Starpoints will added to the SPG member’s account within three (3) weeks from the Game Period end date and upon all eligibility verifications and validations. Use and expiration of Starpoints is pursuant to the terms and conditions of the SPG program. Unclaimed prizes will not be awarded. Approximate Cumulative Retail Value of Prizes: US$113,400.00. No exchanges or substitutions allowed. Prizes are not transferable or refundable and must be accepted as awarded. No cash or other substitution may be made, except by the Sponsor, who reserves the right to substitute the Prizes with another prize of equal or greater value if the Prizes are not available for any reason, as determined by the Sponsor at its sole discretion. All expenses not specified are the sole responsibility of Prize winners. The winners are responsible for any taxes and fees associated with receipt or use of the Prizes. 10. PRIVACY AND PERSONAL INFORMATION: By participating in this Game, and by providing this information, you authorize Starwood to collect, process and use such information for lawful, Starwood business-related purposes; to store your information at and transmit it to various locations throughout the world, either directly or through third-party vendors, whether within your country of residence, the United States, or elsewhere. To learn more about our data collection and usage practices, please see our Privacy Statement at starwoodhotels.com. 12. RELEASE AND LIMITATIONS OF LIABILITY: By participating in the Game, entrants and their designated guests agree to release and hold harmless the Sponsor, USTA, USTA National Tennis Center Incorporated, City of New York, and their respective officers, directors, employees, and agents (the “Released Parties”) from and against any claim or cause of action arising out of participation in the Game, or receipt or use of any prize, including, but not limited to: (a) unauthorized human intervention in the Game; (b) technical errors related to computers, servers, providers, or telephone or network lines; (c) printing errors; (d) lost, late, postage-due, misdirected, or undeliverable mail; (e) errors in the administration of the Game or the processing of entries; or (f) injury or damage to persons or property which may be caused, directly or indirectly, in whole or in part, from entrant’s participation in the Game or acceptance, receipt, use or misuse of any prize. Entrant further agrees that in any cause of action, the Released Parties’ liability will be limited to the cost of entering and participating in the Game, and in no event shall the Released Parties be liable for attorney’s fees. Entrant waives the right to claim any damages whatsoever, including, but not limited to, punitive, incidental, consequential, direct, or indirect damages. Sponsor is not responsible if any prize cannot be awarded due to travel cancellations, delays or interruptions due to acts of God, acts of war, natural disasters, weather or acts of terrorism. 14. GAME RESULTS: To find out the name of the Grand Prize winner, send a self-addressed, stamped envelope (U.S. residents only) by October 15, 2014, to: SPG’s Tap Into Luxury Game Winner, 420 Summit Avenue, St. Paul, MN 55102. Previous articleWhine Wednesdays: Appropriate Lounge Attire?